Some people believe that self-love and self-compassion are two separate terms, but to be honest, they go hand in hand and they are inextricably linked. Ultimately, the most importantly aspect of self-love and self-compassion is this: learning to love yourself and be kinder to yourself if you aren’t already. In order to enter the enlightening path of self-love and self-compassion, here are our tips to help you. Being assertive is one of the most important skills in life that you will ever need. Being assertive means that you are able to stand up for yourself and put your needs forward (as well as other people’s needs.) Sometimes in life we may be faced with situations where we’re under pressure or at risk of being overloaded, so learning to say no and prioritise is important. Celebrate your strengths. In fact, celebrate who you are and play to your strengths. It’s so easy to criticize ourselves but that’s just negative. Be proud of all that you are good at and all that you have achieved. Having said that, acknowledge your flaws and work on them. After all, no one is perfect and we all have our weaknesses. Be kinder to yourself and treat yourself. Take a break and relax. Have moments where you can reward yourself. Take care of your body – your physical and mental health are equally as important. It’s all well and good having the ability to love yourself and to be compassionate towards yourself, but if you are surrounded by toxic people and you are in a toxic environment, then those feelings of self-love and self-compassion will quickly disappear, not matter how strong and unfazed you are by other people. Ditch those toxic people – or keep your distance from them at least – and surround yourself with positive people who can influence you in the best way possible. Similar to my previous point about embracing your strengths, have faith in your abilities. Don’t feel ashamed if you don’t have a particular skill. Instead, embrace what you are good at and show that you are good at what you do. For example, I have always loved writing, but I didn’t feel I was good enough at it and I felt as though I couldn’t express how much I loved it. Now I celebrate the fact that I am writer and I love it. In fact, since I became confident in my ability and since I started to embrace that this is something I am good at, I have gone on to study an essay based degree programme at university and I am now pursuing a career in the media. Once you celebrate what you are good at, it opens up the path of opportunities and it allows you to feel confident and happy. Be appreciative of who you are. Be grateful of your qualities and surround yourself with those who appreciate you too. …but most importantly, treat yourself how you would like to be treated. You deserve kindness, respect, love and compassion, so treat yourself in a way that shows that you have and deserve those traits. It may sound a little bit strange, but telling yourself positive affirmations – in your head or out loud – on a regular basis can help increase your confidence and place some faith in yourself, as well as showing some self-love. It’s so important to believe in yourself and stating positive affirmations helps you to do that. Watch out for those nasty thoughts and actions. It’s so easy to think negatively, doubt yourself and to self-criticise but once you notice yourself doing that, you can counter-attack those thoughts and actions with something positive. Don’t ever judge yourself or put yourself down. It’s okay to make mistakes – we are not perfect and life is full of good and bad times. Regarding self-compassion, the most important thing to remember is that we all share a common humanity. Once you take note of that then it is so much easier to have love and compassion for yourself. Chichi is from London, United Kingdom. 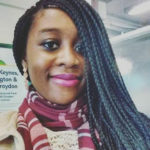 She is a Politics and Sociology graduate, writer and fashion, beauty and lifestyle bloggger. She's a big believer in living the best life for yourself and taking control of your own destiny.